convince moms that convenience is the most important piece of food selection. But if you think about it, staying up all night with a child who has an ear infection or a fever is not all that convenient. 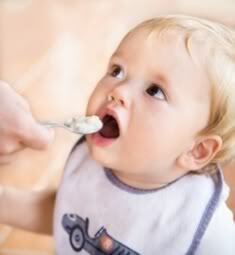 Your baby should be four months of age at the very least -- before this, his immature digestive system will find it difficult to cope with solid food. Most medical professionals, however, will advise waiting until your baby is at least six months of age, to reduce the risk of food allergies. Once baby is used to eating single foods, you can start combining foods for improved flavor and texture. For instance, some babies prefer bananas mashed with applesauce to change the texture. Others are happy to eat chicken as long as it is hidden in sweet potatoes, but won't eat it alone. My little girl loves mashed prunes in her bananas, but refuses to eat bananas or prunes alone. The proteins in egg white tend to cause allergies and should be avoided till baby is about at least 10 months old. Also, baby will probably be able to sit up with support at this age. Once he does that, you can put him on a high chair and feed him there. Baby rice, an easily digestible, single grain cereal, is the ideal food to start with. It can be mixed with warmed breast milk or formula, so its taste will be familiar to your baby. Initially, you can mix it to a fairly runny consistency that your baby will find easy to cope with, thickening the texture slightly with each subsequent feed.